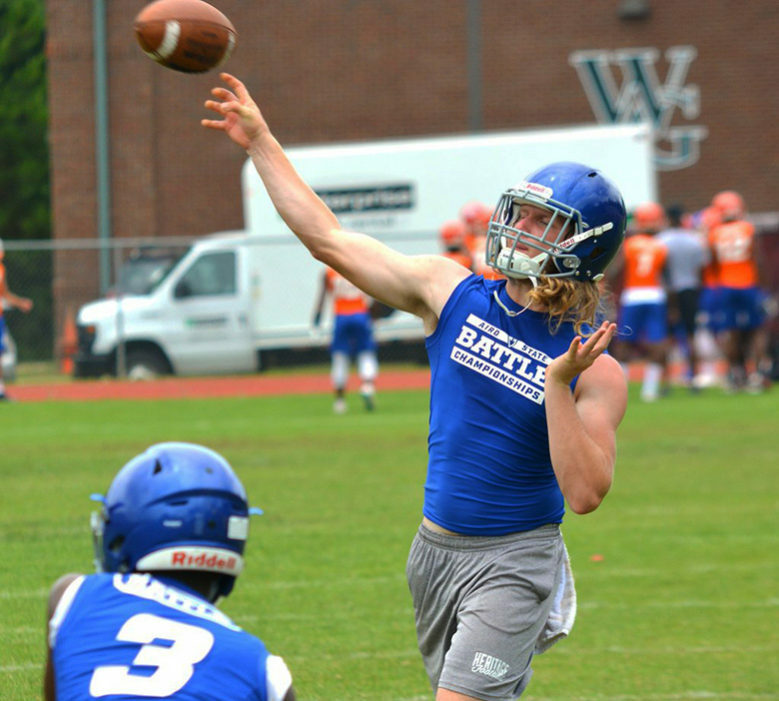 CONYERS, Ga. — Caleb Pruitt can pinpoint the exact moment during his 2016 season that best defines him as a quarterback. It happened during the second half of a rare Heritage win over rival Rockdale. When Pruitt rattles off the particulars of the play, he sort of sounds like the coach who drew it up. Big for many reasons. It was the longest pass play from scrimmage for Pruitt on a night when he threw for 276 yards and two scores while completing 19 of his 26 passes. It was also, perhaps, the back-breaker in Heritage’s 39-28 win over Rockdale — a rare win for the Patriots against their in-county rivals. Huge also for the 6′, 188-pound rising senior who went on to throw for 3,315 yards, 29 touchdowns and 12 interceptions, while also rushing for 181 yards on 42 carries. It was a breakthrough year for the Heritage signal-caller who thrived in coach Corey Johnson’s new offense that gave Pruitt the chance to show people what he can do. If that sounds like it all comes natural for the senior, it may be because he’s been around the game enough to where his new coaches could quickly tell they could trust him to be somewhat of a coach on the field. Nothing new for Pruitt, who says he’s been around football all his life, thanks to his dad, Brian. Pruitt has also found a way to get more weight to stick onto his 6′ frame. He’s up close to 190 pounds after offseason workouts, where he increased his strength while maintaining his speed. And while he understands that many colleges have held back their trigger fingers on offering him a scholarship — to this day Pruitt has some interest, but no official scholarship offers — he chooses not to focus on things that he can’t control, like his size. He continues to concentrate on fine-tuning his game, which means finding players of similar size to model his style after. He voraciously studies the cerebral part of the game, watching mounds of film and gaining confidence from Heritage’s coaching staff, which he says trusts him with a lot of responsibility. One thing Pruitt says he continues to see for himself is a bright future at the next level, no matter where he ends up. And he understands that the whole world doesn’t have to offer him, as long as the right school does.